Besides him, the quarterback Jim Kelly and the defensive end Bruce Smith already received the recognition for the club. The Buffalo Bills published this past Wednesday, that no one will use the number 34 anymore. 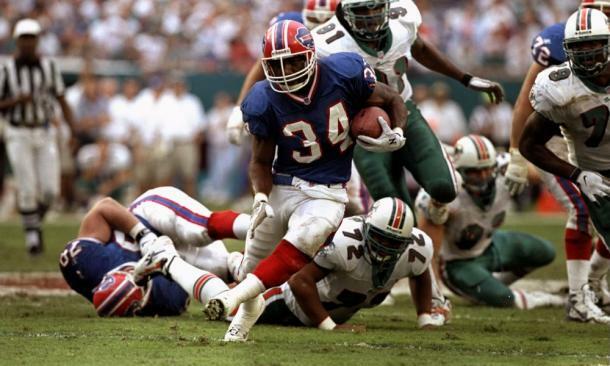 The number was used by Thurman Thomas and the Bills have decided to retire the jersey of one of their famed running backs. Thurman's jersey will become the third retired in Buffalo's history. Besides Thomas' number, the quarterback Jim Kelly and the defensive end Bruce Smith gained such recognition by the club and it's only fitting that Thurman be associated in such illustrious company. Thurman Thomas was made a member of the Pro Football Hall of Fame and College Hall of Fame due to his exploits throughout his playing career. He was drafted into the National Football League in 1988 out of Oklahoma State as a second-round pick by the Bills and it ended up being a great pick for the AFC East side. He spent 12 seasons in Buffalo, from 1988 to 1999, and one season with the Miami Dolphins in 2000, garnering 12,074 total rushing yards, 65 touchdowns and 2,877 career rushing attempts. Thomas also added 4,458 total receiving yards and 23 receiving touchdowns on 472 catches in his career. Besides being inducted to the Bills Wall of Fame in 2005, he ended his career as Buffalo's all-time maestro in rushing yards, totaling 11,938 yards and 65 rushing touchdowns. Thomas is the only player in NFL history to lead the league in yards from scrimmage in four straight seasons, from 1989 to 1993 overall. Not many players have had the career that Thurman has had and it's only fitting that his jersey be retired by the Bills.